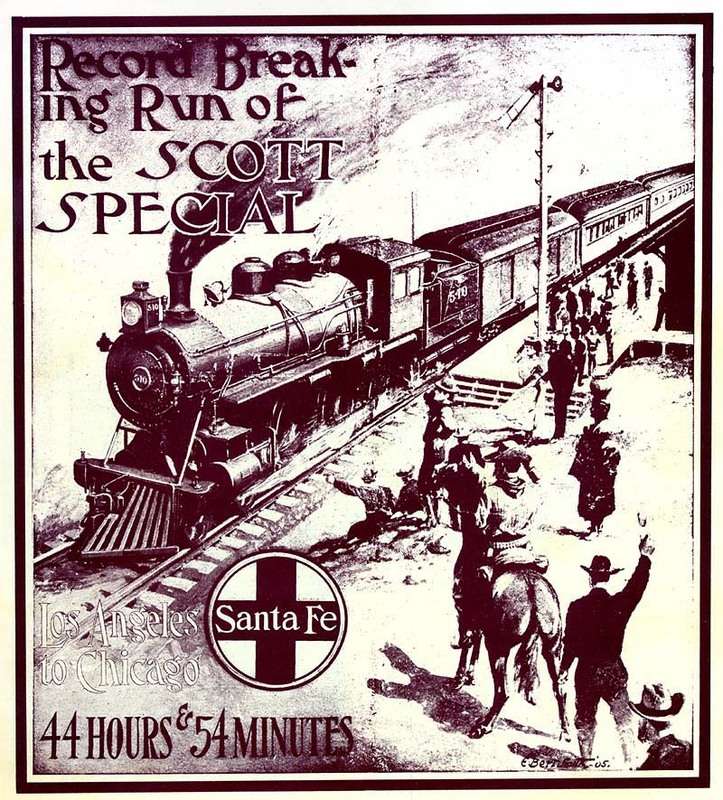 Record Breaking Run of the Scott Special, Los Angeles to Chicago, 44 Hours & 54 Minutes. Los Angeles to Chicago, 44 Hours & 54 Minutes." Atcheson, Topeka & Santa Fe Railway, 1905. Originally published by A.T.& S.F. Railway, 1905. Sepia tone, 8"x9" 30 pages. Photos and drawings of engine types, engineers and crew. Two page map showing route of the Scott Special Train in July of 1905. Photos of Death Valley Scotty and his wife. Biographies of the Scott Special Engineers. Courtesy William Gardiner Hutson Collection. At one o'clock in the afternoon of Sunday, July 9, 1905, a special train, chartered by Mr. Walter Scott, pulled out of LaGrande Station of the Santa Fe System at Los Angeles. The train consisted of engine number 442, baggage car number 210, dining car 1407, and the standard Pullman car Muskegon, the three cars weighing exactly 170 tons. This was the train which came to be known as the Death Valley Coyote and the Scott Special. At 11:45 on the forenoon of July 11th, it came to a stop in the Dearborn Street Station, Chicago, having made the run of 2265 miles in 44 hours and 54 minutes. The record stands unparalleled in railroad history. A few minutes before noon on Saturday, the eighth of July, a man walked into Mr. John J. Byrne's private office, in the Conservative Life Building, Los Angeles. Mr. Byrne is Assistant Passenger Traffic Manager of the Santa Fe lines west of Albuquerque. The stranger wore a cheap suit, a blue woolen shirt, high-heeled vaquero boots, a cowboy hat, and a fiery red tie. He pitched the hat into one corner of the office, tossed his coat on the settee, and dropping into the chair remarked quietly: "Mister Byrne, I've been thinking some of taking a train over your road to Chicago. I want you to put me in there in forty-six hours. Kin you do it?" Mr. Byrne whisted. "Forty-six hours?" said he. "That's a big contract, Mr. Scott. That is 11 hours and 56 minutes faster than the eastbound run has ever been made. Man, do you realize that half the road is over the mountain division?" "I ought to" answered Scott. "I've been over the Santa Fe thirty-two times between here and Chicago. Here's the money!" And the man in the blue shirt began to shed $1000 bills. "I'm willing to pay any old figure, but I want to make TIME! Kin you do it for me, or can't you? Let's talk business!" Mr. Byrne drew out his pencil, and as he figured he talked. The miner broke in every few minutes with a shrewd remark. The conference lasted a long time, and in the end Mr. Byrne put the $5,500 in his safe. The train had been bought and paid for. "Young man," said Mr. Byrne, "the Santa Fe will upt you into Chicago in forty-six hours, if steam and steel will hold together. We've got the roadbed, the equipment, and the men; don't forget that. But let me tell you that you'll be riding faster than any man ever rode before!" "Pardner," said Scott, simply, "I like your talk. It sounds good to me. Line 'em up all along the way and tell 'em we're coming." An hour before the time appointed, the Coyote Special was standing in the depot. Thousands of curious sightseers were on hand to see the miner start on his wild ride for a record. As the time drew near, the crowd increased until the train sheds were packed and from every eminence faces looked down. A big engine slowly backed up and wheezed into place at the head of the train. It was No. 442 (Baldwin 10 Wheeler) in charge of Engineer John Finlay. A big automobile dashed up to the entrance of the station and Walter Scott alighted. He had to fight his way through the crowd to get to the train. Entering the cab, he shoook hands with the engineer, greeted the firemen, and urged on by the crowd, made a short speech from the tender. In the meantime, the party who were to accompany him boarded the train. Mrs. Scott, a comely young woman altogether without nerves, awaited here husband in the Pullman. C.E. Van Loan, the newspaper representative who was to write the story of the run, busied himself with his typewriter, hereof completed the quartet. At last the clock pointed to the hour. No. 442 gave a warning toot, visitors scrambled off the train, Conductor George Simpson raised a long forefinger and the Coyote began to move. A great cheer went up from the spectators, Scott waved his slouch hat in response, and inside fifteen seconds the Coyote disappeared from sight. The passage through the city was a fleeting ovation, crowds lining every side street to see the train dash along. The little towns outside Los Angeles flitted by like shadows, the cheers of the crowds shrilling an instant and then dropping away from the tail of the racing train. Thirty-five miles out of Los Angeles, the jar of the air brakes told that something was wrong. The big engine was slowing down and high on the flank of the mountain of steel, a fireman was clinging. Before we reached Summit the helper engine was uncoupled on the fly and, while the speed of the train never slackened for an instant, the light engine dashed ahead, ran onto a siding, the switch was thrown back, and the on-coming special whirled over the crest of the hill. Here it was a different story. We were on our first descending grade. The problem now was not how fast we could run, but how fast we dared run. So we shot down toward Barstow at a mile a minute, turning and twisting in and out, Engineer Finlay's hand always on the air-brake. When we made the mile between mile-posts 44 and 43 in 39 seconds, or at a rate of 96 miles an hour, we began to feel that the great race was fairly on. Fast time on a mountain division is a very different proposition from the same rate on the straight-away of the plains. Mountain divisions are full of curves and if one pauses to reflect on the impact with which 338 tons of equipment hits the outer rail of a sharp curve when hurled against it at the rate of 90 miles an hour, the charm of record-breaking is tinged with the pale cast of thought a whole lot. Personally, I am glad that I did not have time to think of these things while they were happening. It is much wiser not to inquire too curiously into such matters until afterward. Meanwhile the certainty that your welfare was the thought uppermost in the cool brains of every member of the operating department of the Santa Fe System, compares not unfavorably with the comforts of a clear conscience. At any rate, it supplements them nicely. Back in the Pullman, we knew that every man who had our safety in his keeping had been picked with reference to his known possession of the qualities which make for security as well as speed – safety first, then speed. And so, when they told us that we were skimming their roadbed faster than a train had ever done it before, we patted the Santa Fe System on the back and said: "Hit her up!" We whistled into Barstow 26 minutes ahead of the killing schedule which had been laid out for us. That 26 minutes was the gift of Engineer Finlay and his crew, and anyone looking for good railroading may rely on them to repeat it as often as the call comes in. At Barstow we changed engines for the race across the desert. It was a warm run from Barstow to the Needles, but the Coyote took it on the fly, causing the lizards to hastily hunt their holes and making the cacti by the roadside look like a hedge fence. At 7:13 the Colorado River shimmered in the distance; at 7:17 the Coyote came to a standstill at the head of the Needles yard. In exactly eighty seconds the train was moving again, a fresh engine taking up the work. Thousands lined the track near the depot, but they had no more than a fleeting glimpse of the flying special and she was gone. Twelve tortuous miles below Needles the Santa Fe crosses the Colorado River on a steel cantilever bridge – a marvel of modern engineering, flung solidly across a wide, tawny stream. Engineer Jackson swung over that twisting track at 65 miles an hour and the glasses leaped in the diner. A rush of sound, a creaking of bridge timbers, and with a dull whirl the Coyote found Arizona soil. Have you ever seen the salt cellars playing ping pong with each other? It is not conducive to a healthy appetite. One gets to wondering what would happen if an engine should take the ditch going at that rate of speed. The correspondent looked over at the conductor, Tom Brayil, and it was great relief to an amateur record-breaker to note that he was still smiling. "Jackson don't know a curve when he sees one," called the conductor across the car. "The whole road looks straight to him." Three hours of hard mountain railroading brought us to Seligman, where we picked up an hour. Division Superintendent Gibson climbed into the Pullman and his first facetious words were: "What detained you?" Jackson's dare-devil run will go down in song and story as the most spectacular dash of the western section. Then began the real fight of the trip – a war against heavy grades. Clouds of sparks whirled by the windows – the little Arizona towns winked once as the Coyote passed. It was here, they said, that we were to win or lose, for if we could make the schedule up and down the divides which separate Seligman from Albuquerque, win over the famous Glorieta Pass, and hold our own on the Raton Mountains, the record was ours beyond question. It is impossible, recalling the events of that nerve-racking night, to pick out for special mention the names of the railroad heroes who won for their road a victory over those grim Arizona mountains. I only know that from time to time crews of stern-visaged men succeeded one another; that engines were changed in record haste, and that Division Superintendent Gibson, heavy-jawed, laconic, and resourceful, rode the train, alert, confident, and conquering. Outside the cool mountain wind swept through the stunted pines and over all twinkled the clear stars of the great Southwest. There was no sleep on board the Coyote that night. In far-off cities tireless presses were reeling off the story of the flying Coyote, and on board the train "Van" hammered away at his staggering typewriter, clicking off the tale of the run which now belongs to railroad history. It was not until the first switch at the outer edge of the Albuquerque yards clattered beneath the flying wheels that Superintendent Gibson smiled. "I've brought you over the Albuquerque Division 34 minutes faster than any train ever went over it before," said he, as he bade us goodbye. He had beaten the time of the Lowe Special by 34 minutes; he expected to beat it by 30. The two Indian villages between Albuquerque and Lamy had never seen a train dropped down a hill at such a rate of speed. Engineer Ed Sears was at the throttle and every inch of the track is well known to this big engineer. A helper engine swung in at Lamy for the climb to the top of the Glorieta, one of the steepest grades on the entire run, 158 feet to the mile. Back in the Pullman, Trainmaster Jim Kurn grinned as he greeted Scott. "Here's where you get a touch of real mountain railroading," said he, "and we're going to beat the schedule if we have to sidetrack that dining car. She's got another hot box." "Sure," said Scott, "If she smokes any more, cut 'er out!" A few minutes later the Coyote struck the Apache Canyon, a wild bit of mountain country, memorable as the scene of many an Indian fight. At the rate of 40 miles an hour the train climbed the incline; there was a few seconds delay as the helper engine dropped out, and then began the "real mountain railroading." Down the steep grade, Sears drove his engine, the white mile posts flashing by at the rate of one every minute. The whole train lurched and staggered over the reverse curves, the typewriter carriage banged from side to side, and the passengers, looking at each other, smiled. It seemed that the train must leave the track as it took those great curves. It was impossible to stand up in the leaping swaying Pullman. One man tried it; his shoulder went through the window. After that we were all content to sit still and hang on. Only Jim Kurn was calm. He knew Sears' reputation for careful running, but it seems to me the engineer crowded the limit hard that morning. None of us were sorry when the train stopped at Las Vegas. At Raton, Jim Kurn said his goodbyes. "You're a long way ahead of that schedule now," he said, "and it won't be our fault if the people east of here don't shoot you into Chicago on time! It's hard work fighting these mountains twenty-three hours out of every twenty-four, but show me a mountain railroad man who wants a job on a plains division! Good luck!" Two engines took the Coyote at Raton. The time of the change was a trifle over a minute and we were off again. "Hud" Gardner is another mountain engineer who knows the game. He brought us into La Junta at 5:13, hours ahead of schedule and the worst part of the journey behind us. East of La Junta lies the Santa Fe "race track." It is here that trains are supposed to make time. With a straight track, the Kansas plains lying level as a floor and a good roadbed underneath, the Coyote took up the second part of the journey. "An American cowboy is coming East on a special train faster than any cowpuncher ever rode before; how much shall I break transcontinental record?" All that Monday night the miles flew from under the whirring wheels; in places at the rate of 85 and 90 miles an hour; the average for 300 miles being a mile every 50 seconds. The great Kipling once wrote the story of a recordbreaking run East over this same road. It is a part of his "Captains Courageous." It was fiction, but it reads like fact. That is because Kipling wrote it. On almost every point covered in his narrative of the fictitious run I can say he tells the truth. He says, however, that "the ties ripple and surge away behind the flying train," and for once he is wrong. Given a reasonably straight piece of roadbed, and the faster the train goes the smoother it goes. And the ties do not ripple and surge away behind it. The roadbed just slips away, as the paper slips from the roller of a big newspaper press. That was the way it slipped from under the wheels of the flying Scott Special. Josiah Gossard, who has been an engineer on the Santa Fe for twenty-three years, took the train from Emporia to Argentine in the quickest time ever made between those two points – 124 miles in 130 minutes, notwithstanding four slow orders and several grade crossings. Gossard has a medal, recently presented by the Shriners, for making up one and a half hours of lost time on their special, newton to Kansas City. It was nearly eight o'clock Tuesday morning when the Coyote crossed the Mississippi. The end was almost in sight now. We had taken on another engineer at Ft. Madison shops just on the western edge of Illinois. He was a German named Losee. As a fine finisher in the stretch you will look a long time for his equal. Stolid, modest, destitute of nerves, he is the direct antithesis of the daredevil engineer of fiction. With Losee at the throttle and a straightaway stretch to the wire, the Coyote cut loose for the run home across the State of Illinois. And so they made a holiday of that July morning, and every little hamlet along the line from Shopton to Chicago turned out to cheer the Coyote on to the goal. It was one ovation all throughout Illinois. And Losee was earning every bit of it. The special had made some splendid miles in Colorado and Kansas. She was to outdo them all in Illinois. Losee ran engine No. 510 from Ft. Madison to Chillicothe, 105 miles, in 101 minutes, changing at the latter point to clear track into Chicago, with every switch spiked and the entire operating department standing on its toes "rooting." "Scotty" rode a part of the distance on the engine with Losee, and helped the fireman feed coal into the furnace. From the little hamlet of Cameron to the still smaller one of Surrey is 2.8 miles. "She" made it in one minute and thirty-five seconds, at a rate of 106 miles an hour. The world's record before had been held by the Pennsylvania road, which covered the 2.5 miles between Landover and Anacosta in 102-miles-an-hours time. That was in August, 1895. We lost five minutes in Chillicothe, and four more at South Joliet. Nevertheless we made the run of 239 miles from Shopton to the Dearborn Street Station in Chicago, in 239 minutes. The record-breaking run was ended! CPRR.org is not affiliated with the publisher.